This guest post is brought to you by Rick’s Custom Fencing & Decking. Rick’s Fencing provides design and installation of pergola covers, decks & fencing in and around Salem, Oregon. Pergola covers are known more for their Old-World charm than their ability to block out rain. Still, when you invest the time to grow climbing plants over your pergola, the results can bring you year-round color and a delightful garden escape. A pergola cover entwined with foliage creates an outdoor room that feels like your own secret garden. More outdoor living space. Use a pergola with a natural cover made of climbing plants to extend your home’s living and entertaining space. With this beautiful addition, you’ll create a getaway spot in your own yard that gives you a reason to spend more time outside. Weather protection. When you add enough climbing plants to your pergola, they’ll form a cover that provides shade from the sun’s rays. Or you can add a polycarbonate roof to your pergola for protection from the rain – a popular option for many homeowners. In addition to building a pergola cover over your patio, you can make a “green” tunnel with a series of connected pergolas over a walkway. Add value to your home. A pergola cover, particularly when covered with beautiful flowers, adds interest to your home, which can raise its value. More importantly, the scenery you create adds value to the time you spend in your yard. When considering which vines to plant, remember to choose ones that grow well in your region. While some vines cling to structures on their own, you may need to train others with twine, stakes or trellises. Clematis. With white, pink, purple and deep red flowers, the clematis is an early bloomer and is simple to grow and maintain. The flowers come in small, medium and large varieties. Honeysuckle. If you love fragrant flowers, you’ll love honeysuckle. These climbers are simple to grow and maintain and come with white, yellow, pink or purple flowers. Because it’s a semi-evergreen plant, its foliage provides cover even during the winter. Passion flower. The exotic-looking passion flower, or passiflora, has ten petals, radial filaments in a contrasting color and stigmas that protrude from the middle. This climbing flower is ideal if you want to attract hummingbirds, butterflies and bumblebees to your garden. While the passion flower looks high-maintenance, many varieties can survive winter temperatures as low as -7 degrees. Jasmine. Delicate pink, purple, white and yellow jasmine blossoms fill the warm summer air with their iconic scent. The maintenance required for a jasmine plant depends on the variety you purchase; some do better in cold weather than others. Solanum. Also known as the “potato vine,” the solanum has big purple flowers and can quickly take over a pergola. Pair this flower with other brightly colored climbers, such as deep pink roses, white passion flowers or yellow honeysuckles. Lathyrus. The perennial variety of lathyrus, also known as the sweet pea, has sweet white, purple or pink flowers. Unlike its cousins, this sweet pea variety comes back every year. The most popular materials for pergola covers are cedar and vinyl. Both can be equally beautiful, and each has its own benefits. Cedar: Cedar is naturally resistant to insects, rot and weather. Since it is natural wood, you can stain or pain cedar in the color of your choice. Or leave your cedar pergola in its natural state and refinish it regularly. Vinyl: Vinyl is a synthetic material that’s immune to insect damage, rot, water damage, fading or splitting. Consequently, you don’t need to stain or paint it. 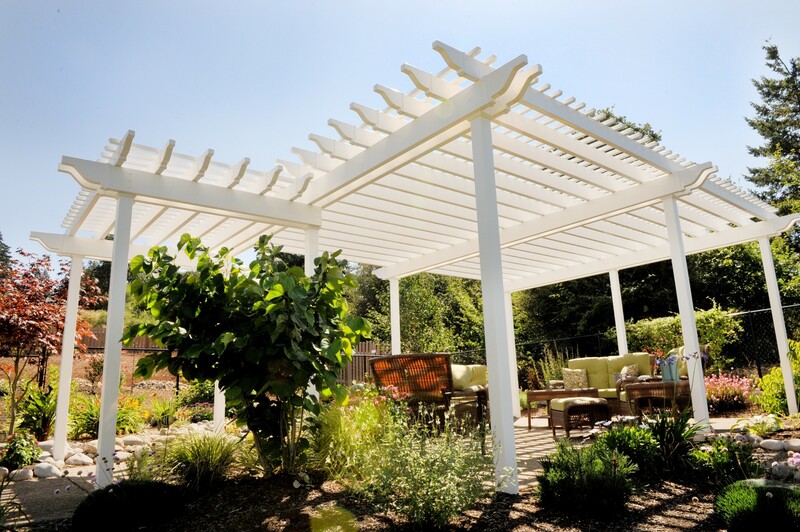 Because the material is so durable, many vinyl pergola manufacturers offer lifetime warranties. Call and talk to one of our designers today to include a pergola and plantings in yoru next landscape project.